Approximately 25,000 units of the successor model of the Ford 3 ton lorry model 1939 were manufactured from 1942 to 1945. It differed from the American Ford 3 ton model 1940 by its one piece windshield. This Ford V8 G 198 TS of the first series, which is identifiable by the S-label on the radiator grille and the bead-styled decoration on the lower edge of the engine bonnet, was used by a unit of the Kriegsmarine which was stationed in Greece. The Ford 3 ton model 1941 was made with four-cylinder (G 188 T) and V8 (G 198 TS) engines, too. Only the model G 198 TS was designated V 3000 S by the Wehrmacht. The sales designation of the G 188 T was B 3000. The four-cylinder model, which was exclusively made for the civilian market, was also offered with wood-gas drive (G 188 TG). The shown Ford V 3000 S was used by II. 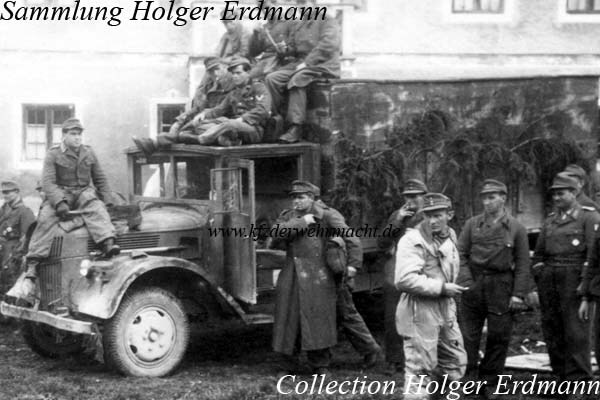 Abteilung of Artillerie Regiment 43. In this photo one can see several brand new Ford V8 G 198 TS. The rear fenders had been dropped due to reasons of production simplification. The second vehicle had the simplified front fenders introduced in 1943. Later, a simplified engine bonnet lock and smaller headlights were introduced which can be seen on the illustrated vehicle. Most probably beginning in late 1943, the models G 388 T (FK 3000) and G 398 TS (FK 3500) were manufactured. If the designations FK 3000 and FK 3500 were used by the Wehrmacht is unknown, too. 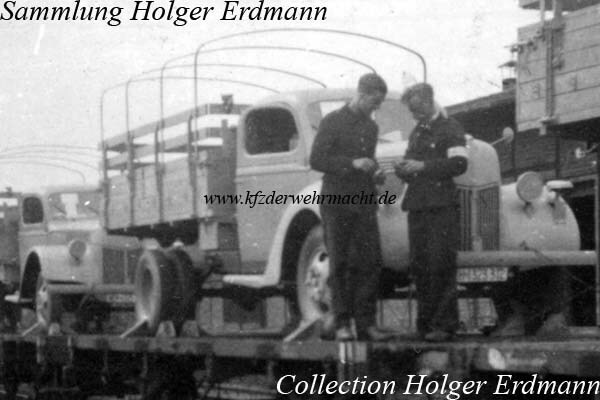 In 1944, the driver’s cab made of sheet steel was replaced by a Holzfahrerhaus made of wood and fibreboard which is illustrated in this photo. 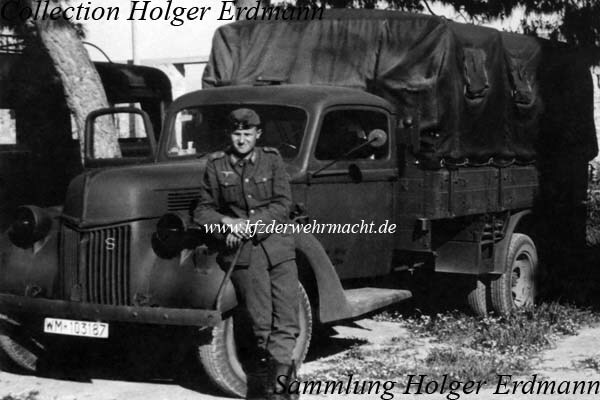 The vehicle belonged to a Luftwaffe aircraft works unit and had LC-Koffer box body which was rarely seen on this chassis. This Ford V8 G 398 TS is a vehicle of the last production model. 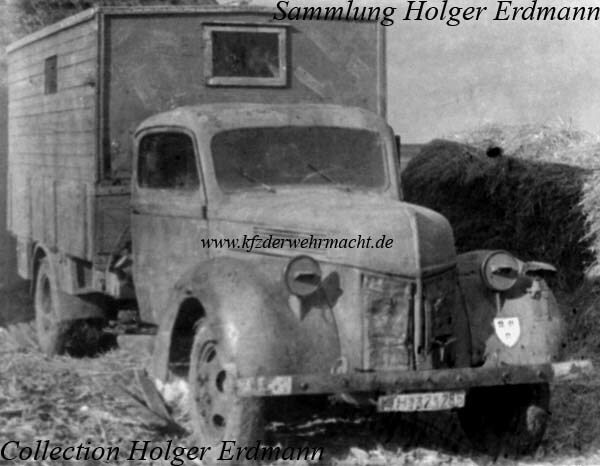 It had a simplified bumper, the simplified front fenders, small headlights, a Holzfahrerhaus and the higher mounted radiator with additional ventilation slots in the engine bonnet. Most probably, the higher mounted radiator was first introduced in late summer 1944. It belonged to Sturmgeschütz-Brigade 280. The photo was made in autumn 1944 on the western front.